Join us on Wednesday, May 8, to paint this Spring Floral vase and enjoy a relaxing evening with friends. 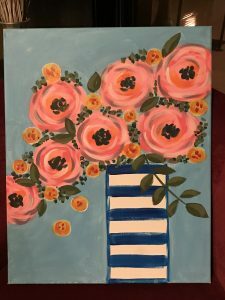 Cindy Carnahan will guide you through the steps to create this canvas art painting so any skill level is welcome and encouraged to participate. $35 includes all the supplies and canvas to complete your project and a glass of wine to start your inspiration! 🍷🧀🥖A special of bottle and cheese board to share with friend will be available for separate purchase.🥖🧀🍷Painting begins at 6 pm.